As Monday arrived for a long week ahead, here's what was going through my mind. From about August last year, I started eating a lot healthier and exercising most days of the week (aiming for 5-6 times per week). I lost some weight, toned up and felt a lot better. The Christmas/New Year period, plus a two-week visit to good food capital Melbourne, has meant that I've lost my way a little. This week, it's back to solid healthy eating and exercise again. 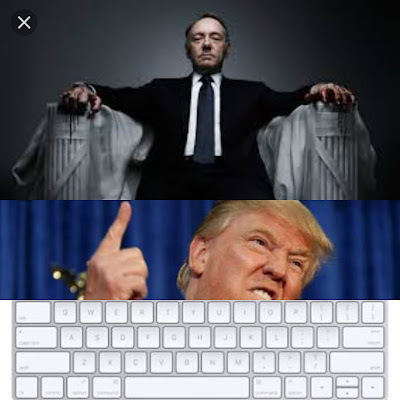 It's been a while since I binged watched a really good telly show (besides re-watching Mad Men over Christmas), so the past little while I've been indulging in The Crown (which is fab), but last week we finally succumbed to House of Cards (about 5 years late, I know). After the first episode, Skip and I looked at each other and shrugged our shoulders but decided to give another episode a go. Hook, line and sinker! It's so good and so addictive. Kevin Spacey's character is delishly bad. We've pretty much watched the whole first series since Australia Day. With Skip away for the week, I have to find something else to watch and save my fix for the weekend. Have you watched it? Queensland has been back at school for a week now and we're settling into routines again very nicely. Exhausted and happy kids, which is so good after the Christmas holidays. They were happy to get back and see their friends and I was happy to have a few hours away from meal preparation. It's been a year since we left Dubai and the past few days I can't stop thinking about the desert city and longing for it a little. It's the little things that keep popping into my head, like the supermarkets, restaurants and the streets I used to drive on. I wonder when (or if) these waves of nostalgia and Dubai-sickness will stop? Even if you wanted to avoid him, at the moment it's impossible not to have Trump on the brain. Every time I see him I can't believe the power that has been given to him. The things he's said and done (especially in the past week) are frightening. Like most of the world, I can't help wonder how this is all going to end up, as I think whatever happens it's not going to peter out quietly. Personally, I'd prefer to watch fictional evil politicians than real ones! I've really missed writing the past 12-18 months and I'm really going to try and set aside some time to write again, whether it's here or elsewhere. I know I've said it before, but this time I will. It's a really interesting time in the world at the moment. As I was sitting in the car on the long drive home to Brisbane from Melbourne, we had the radio on and there were many hours of hearing the news bulletins on repeat - Trump's inauguration and the awful event in Melbourne were, of course, the big stories of Friday and Saturday. I'm a positive person, I'm not someone to start yelling that the sky is falling the moment something bad happens, because the unfortunate nature of our world and of humans means that something bad is always going to happen. On the flip side, something good is always going to happen too. As we saw on the weekend with the Women's Marches around the world, people were stirred up and being stirred is a great thing. When we get angry, riled, passionate, when we feel something, good things can come of that. We realise the importance of truth, kindness, respect and how not only how fragile those things can be, but also how, in the hands of a majority of people, how strong they can be too. I know that Trump and the people like him (such as a certain redhead regaining popularity in our country) are going to say and do some despicable things in the forthcoming months and years ahead. In reaction to this I also see a rise in good people speaking out too. I see a rise in people being urged to write and create. I foresee great music, movies, art and literature being created and used as a weapon against ignorance and fear and intolerance. As history has told us bad things happen and nasty people exist, and in the face of it good people dig down and create good things in response – as long as we keep feeling something and not remain apathetic. Perhaps, it's a great reminder, especially for the younger generation that we need to continue to fight for the things that are important. A reminder that is wasn't too long ago that women weren't able to vote, to easily divorce, have control over their own bodies or their own lives. A reminder that those before us had to fight incredibly hard to gain the rights that we take for granted. That it wasn't so long ago that, shamefully and mind-bogglingly, indigenous Australians weren't even recognised as Australian citizens. So as long as we keep thinking critically and logically, as long as we stay stirred up and keep apathy at bay, as long as we aren't short-sighted or have short memories, I truly believe some great things can come about. What do you think?